The California Public Utilities Commission issued a decision setting a price utilities will pay customers with roof top solar systems for their net metering contribution of energy to the utility. The decision itself is narrowly focused on the net metering price question at hand, but it sets the stage for a much more profound policy debate over the implications of disruptive technology applications that are enabling customer aggregation and redefining retail energy into wholesale energy choices that will make all the difference. Net metering is a big deal as customers that incur the capital cost of installing solar panels. AB920 adopted in 2009 required the CPUC to set appropriate rates for net metered energy customers supplied. But it has taken two years of debate and proceedings to get to an evidentiary record sufficient for the CPUC to make a decision. Many parties to the proceeding argued about prices. Utilities generally argued for a low payment price representing essentially the avoid cost of energy the utility would otherwise have purchased in the short term day ahead market. The solar community argued for a fully loaded price that reflected the long term capital invested in the solar system. This latter definition would have treated a solar rooftop system the same way the CPUC treats a 500 MW gas fired power generator “brown power” as you will hear it referred to in the decision language. While other parties suggested variations from these bookend themes, there was plenty of record for the CPUC to use to make its decision. Short-term or long term net metered price debate By a 4-1 vote the CPUC commissioners set the net metered price at the short term day ahead energy price (DLAP or average of hourly day-ahead locational marginal prices of electricity at the utility’s default load aggregation point )as the most reasonable approximation of the avoided cost of energy the utility would incur from receiving the net metered energy. This decision disappointed the solar interveners who had hoped for a higher price to help justify their capital costs and make solar rooftop systems more cost effective. The DLAP price for PG&E in December 2009 when testimony was originally filed was 5 cents per kWh compared to the fully loaded market price referent preferred by the solar interveners of 16.8 cents per kWh. So what is the significance of this decision? Net Metering is still good policy. Enabling customers to receive the benefits of their investment in solar roof top systems by being paid for the net generation they contribute to the grid as required under AB920 is a fairer policy than the previous approach which considered any net generation from solar systems as essentially a ‘gift’ from the generator to the utility. CPUC must balance both state law and Federal law and regulations. In setting rates for net metering payments CPUC must not only consider AB920, it must also take into account the requirements under the Federal Public Utility Regulatory Policies Act (PURPA) concerning avoided costs. That is it must balance the interests of net generators seeking payment with the utility’s interest in not being required to pay more for the energy than its avoided cost to otherwise procure it. Short term DLAP net meter prices. There are arguments on both sides of this question and the answer the CPUC gave is prudent and reasonable as a place to start. Requiring the utility to pay the long term cost including the capital costs forces the utility to become an investor in the resident’s roof top solar system. There may come a time when utilities may choose such a policy, but the logic of the CPUC decision is the intent of AB920 was not to force utilities to finance rooftop solar systems but to require it to pay for net metered energy is was actually receiving. The short term day-ahead price at the locational node price where it is received is the appropriate price for that purpose. But there is one more really big matter worth noting—jurisdiction. In every regulatory proceeding one question usually starts the proceeding and any decision. That question is what is the authority of the CPUC to hear this matter? From a legal standpoint the parties including the CPUC want to build into the evidentiary record a foundation for the decision to e reached in case the matter is appealed. In this case, the record had some interesting testimony that may have future importance in a distributed energy future. …under most circumstances [FERC] does not exert jurisdiction over a net energy metering arrangement when the owner of the generator receives a credit against its retail power purchases from the selling utility. Only if the Generating Facility produces more energy than it needs and makes a net sale of energy to a utility over the applicable billing period would [FERC] assert jurisdiction. So there is a nutshell you have the “set up” for the net metering debate in a future customer aggregation proceeding by the giants of then distributed energy future now being created. A net metering transaction on its own is a retail energy transaction subject to the jurisdiction of the states. But aggregate a million solar roofs as California seeks to do and it risks turning that program into a wholesale interstate jurisdictional matter subject to FERC. I suggest to you that build an evidentiary record of these arcane point of jurisdictional law is no accident but a deliberate, progressive, thoughtful and wise move by both utilities and the customer aggregators they should fear most in our competitive energy, smart-grid-enabled future. Scale will be required to survive in a clean distributed energy world. Scale to reach a million solar roofs. Scale to aggregate demand response into meaningful and materials levels of energy equivalent potential. 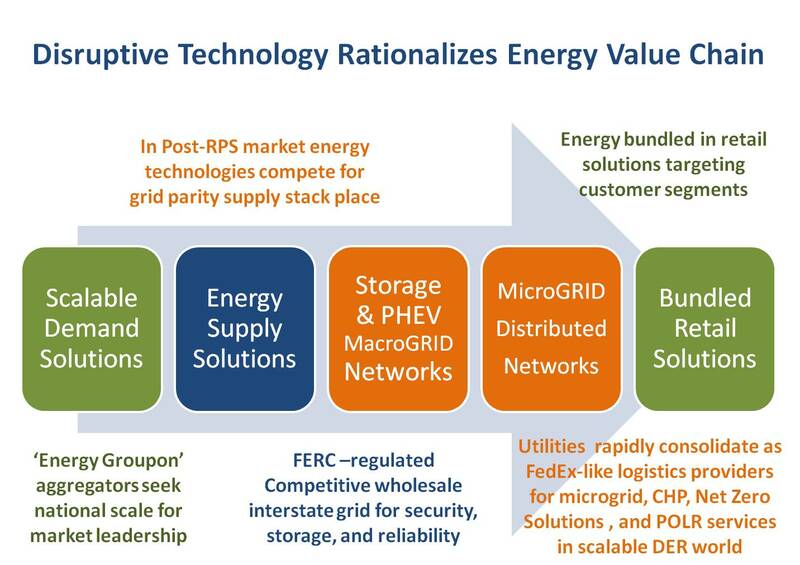 Scale for the disruptive technologies of energy storage, dynamic pricing, and energy efficiency. Not only do investor owned utilities risk losing control over the gateway to customers they have managed for 100 years in a scalable distributed energy future, they risk their very survival in a ruthless Darwinian process of consolidation as the fragmented investor owned utility business gives way to large, scalable, multi-market giants whose role is no longer just to deliver energy to homes and business. The utility of the future will be more like FedEX—the master of logistics facilitating the delivery of energy from many sources to many demands. Instead of dealing with individual customers the utility of the future will more likely deal with aggregators of many customers. Those end-use customers will not likely continue to buy energy as a standalone commodity but will see it bundled along with broadband, voice, information, entertainment, security and other services into convenience bundles segmented to fit the business needs and lifestyles of scores of categories. Welcome to the future! The seeds for our clean distributed energy future of high efficiency, optimized energy performance and value-driven service bundling are being planted in the good soil of net metering and nurtured by customer aggregators yet formed. Would you like the sports package with that DLAP net metering rate?